When we last hosted a princess-themed birthday party, my daughter, Ava, was five. 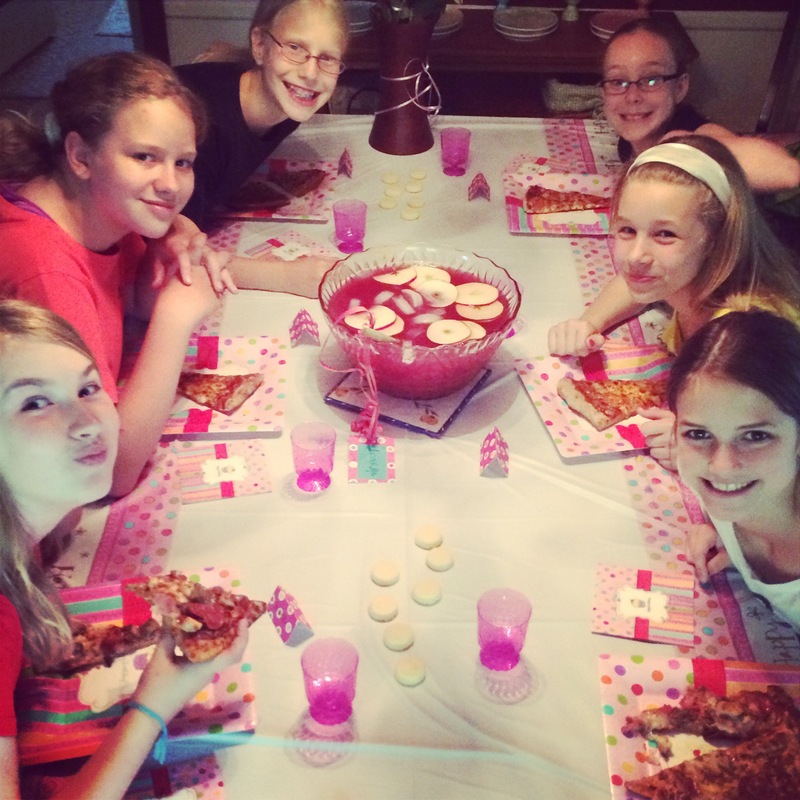 For her 11th birthday, the princess party in pink evolved to the Twisted Princess party. In years past, I had always taken the lead as party-planner. This year, I turned the reigns over to her. She handled it like a pro! She made out a plan for the party including games, food, decor and sleeping arrangements and the main event – a trip to the movie theater to see Maleficent on opening night. We discussed theme options at length. Disney movies like Tangled and Frozen were too little girl like. Plus, every girl would want to be more individual and show their own style thus the Twisted Princess theme. We were going to do full hair and make-up to resemble a randomly selected princess, but our make-up artist (my sister-in-law, Katie), was not available. So Ava opted to throw princess options into a hat for her and five guests including Goldilocks, Snow White, Rapunzel, Alice in Wonderland, Gretel from Hansel and Gretel and Cinderella. They did their own make-up in frighteningly fairy tale style. We chose eats and drinks for the party based on our princesses. 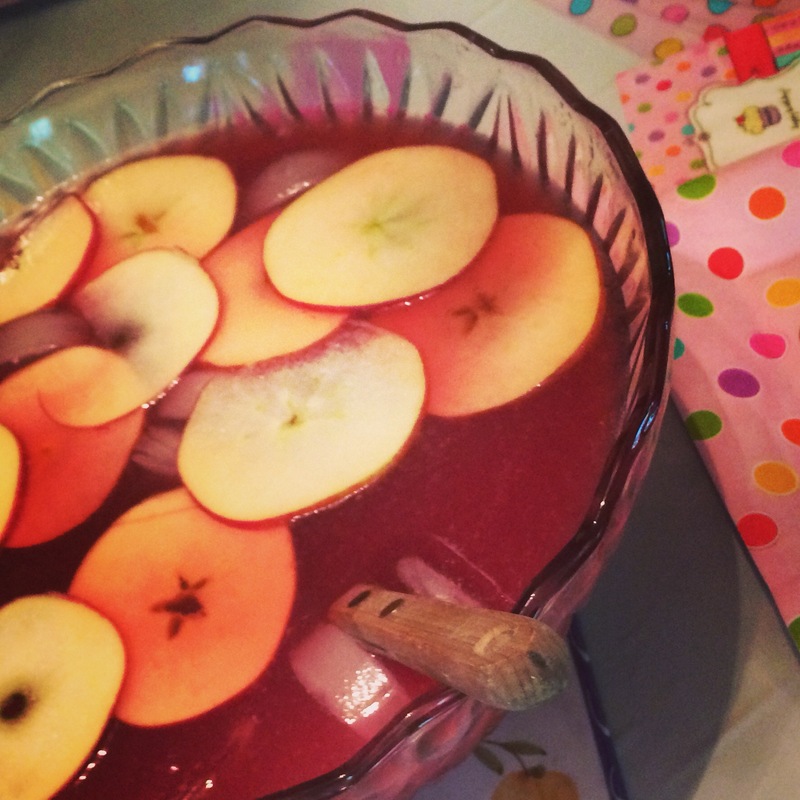 Apple Orchard Punch (Drink Me!) and stacked frosted two-tier cupcakes (Eat Me!) from Alice in Wonderland went over particularly well. Snacks on hand included mini shortbread cookies from Hansel and Gretel and caramel apple slices inspired by Snow White. I’m not sure where Pizza Luce enters into a fairy tale, but I let that one slide. For breakfast the morning after, we went with porridge courtesy of Goldilocks and pancakes just because. Rapunzel and Cinderella did not make the menu. Per the usual, I am cleaning, running to Target and the grocery store several times and hitting up Party City the day before. 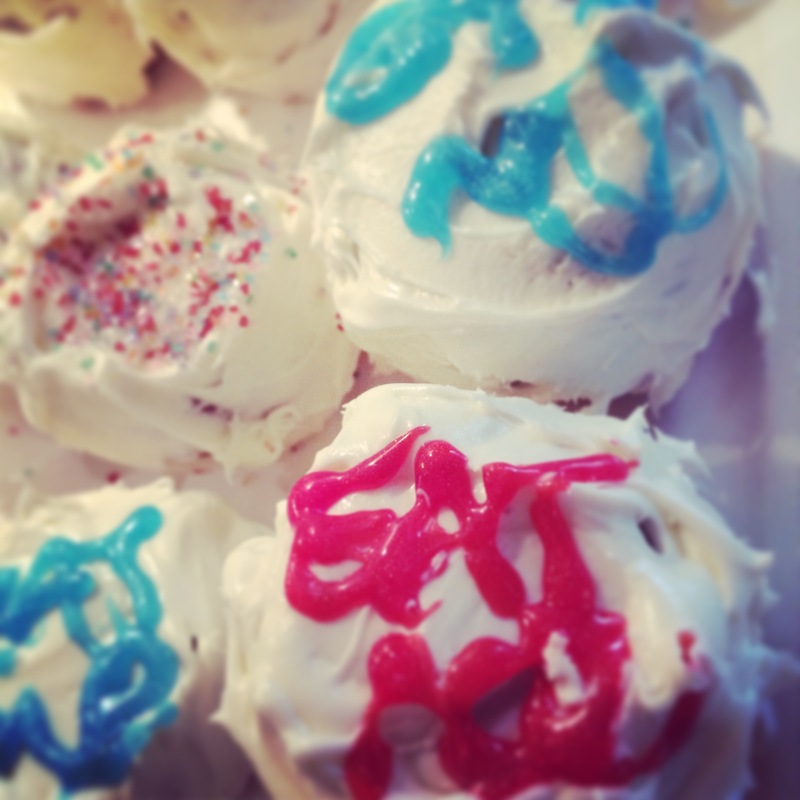 Ava and I make the red velvet and white cupcakes the night before, I frost and decorate them the day of. Party City has some great theme decor, but Ava has outgrown a lot of it. I land on a pattern (Sweet Stuff) that has stripes and polka-dots and walk out of there with a huge fancy balloon and six smaller ones so each girl can have her own color. I pick up Ava and two of her friends from school around 3:00 on Friday. The other two girls join around 4:30. Plenty of time for a full evening of fun! Pizza arrives around 5:15 then we load up and head to Southdale Center for the movie. The ride over is full of who likes who (or more like who doesn’t like who) in typical fifth-grade girl fashion. We get our tickets and then because we have time, rush the mall. 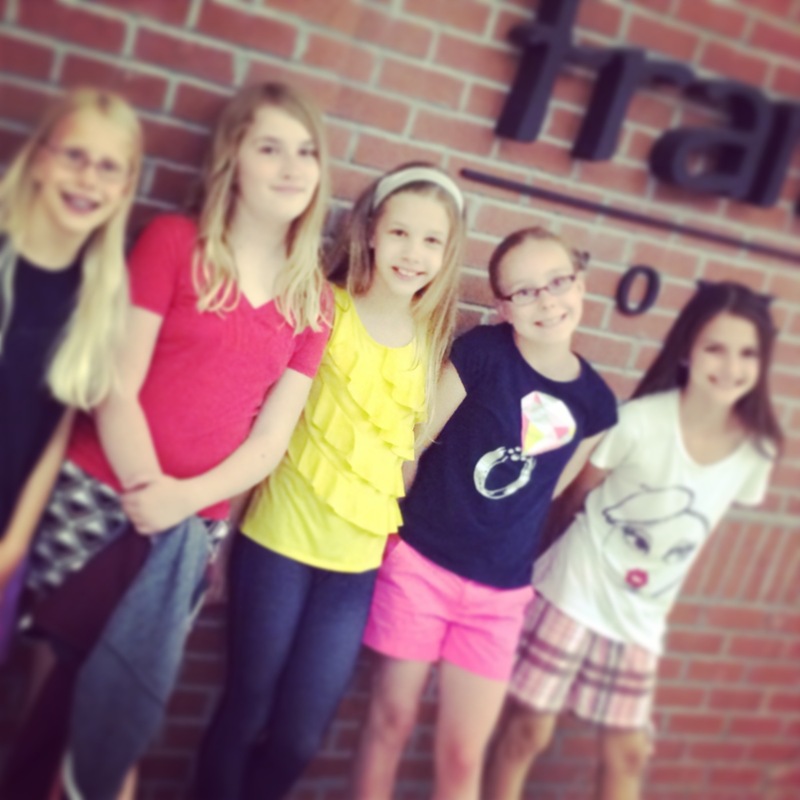 I wasn’t prepared to see these girls so crazed about shopping – – I could not control them! After breezing through Len, See’s Candies and Francesca’s, we wrap it up and head back to the theater. Maleficent starts with a promise of Disney magic and Angelina is amazing in high cheek bones, wings and horns. Much wrath, life-like tree fighters and a mythological world evoked scenes from Lord of the Rings and Avatar. The girls agree it was a good movie, but it did not leave them raving about it. 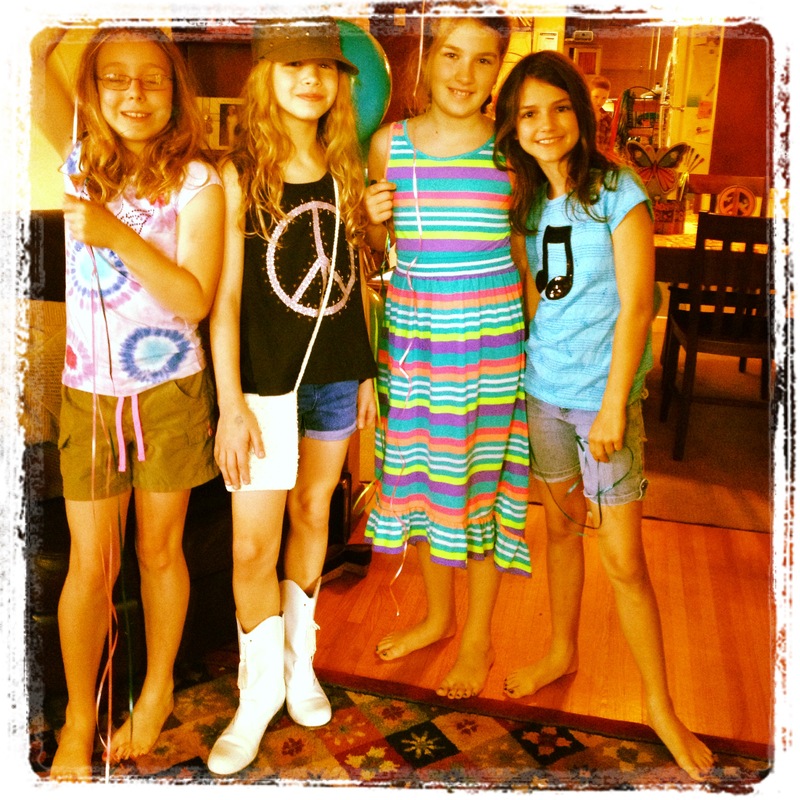 We arrive at our house post movie and the girls engage in an art contest – there are creators and judges. The rules: no winners or losers, every entry gets a “best of” award for something. How very diplomatic of them! … I personally love that it’s quiet for a short while. Then my 8 year-old son, Calvin, descends upon them to control the tunes. Then dancing. We break for cupcakes (which served as her birthday cake) and more punch. On to a movie and more make-up. I leave them to their own. I head to bed and they are up until at least 1:00. The next morning, we have some groggy girls. Some have to leave early for family stuff, sports and other activities. I am worn out from all of the planning and party and per the usual, could use a nap now! — Happy 11th Birthday, Ava! We love you! Celebrating a decade of existence is no small matter. Each year, we start contemplating themes early in May for my daughter’s early June birthday. There are always many variables — how many to invite, what to do, what to eat and when to have it. This year, I suggested a few options – 1) invite everyone and keep it to a three-hour party at our house or 2) invite up to three girls and call it a sleepover. Ava, my recently turned 10-year-old, first tried to compromise. She wanted to invite everyone for a few hours, then have a few stay overnight. I was not taking alternate options. After a few days of deliberation, she selected the slumber party/sleepover. We hadn’t ventured this route yet, but I figured it was time. The girls were mature enough to handle it (was I ready?). Because the invite list was small, I did a quick text poll to the girls’ moms to find out which of two dates worked best. With that nailed down in less than 12 hours, we had a date, our guests confirmed and a general idea of activities. We did a quick evite (as opposed to elaborate handmade invites in years prior) with a tentative schedule: 2:00p.m. on a Friday until 9:00a.m. 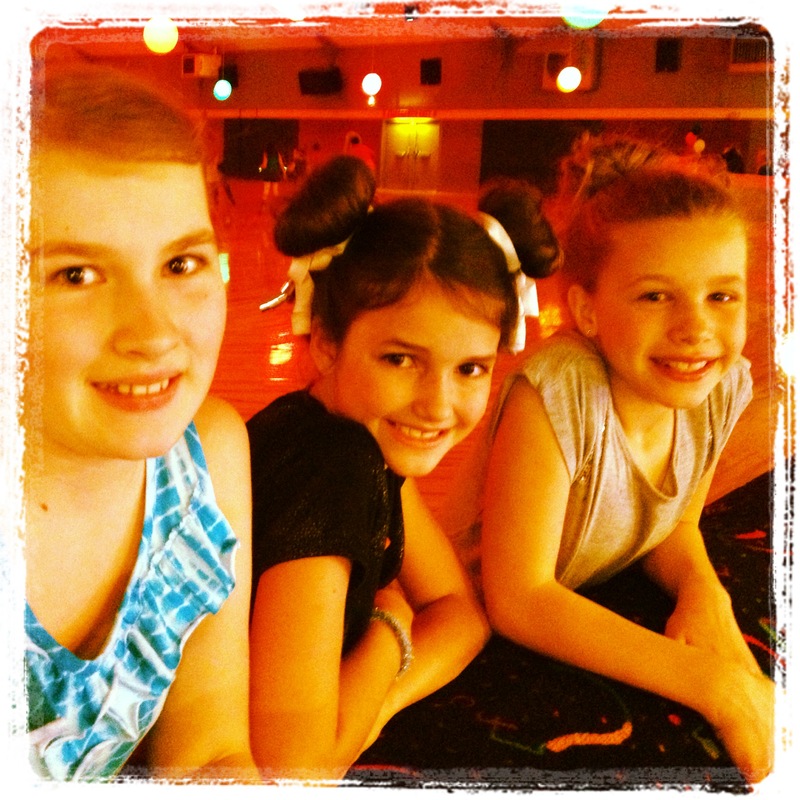 on a Saturday; and activities: roller skating, pizza, pedis and movie. The kids’ birthday parties each year always seem like quite a production. Maybe it’s because we never throw any adult parties. I do a quick run-through of parties past and notes to self from previous years – outsource food, simplify decor, clean and plan like crazy. Since food is snack stuff and pizza at a restaurant is easy, I opt to make a four-layer red velvet cake, Ava’s choice. For whatever reason, I always make the cake. This one was towering. The slimmest silver of it was plenty. For decor, I hit Litin Paper no earlier than 10:45a.m. 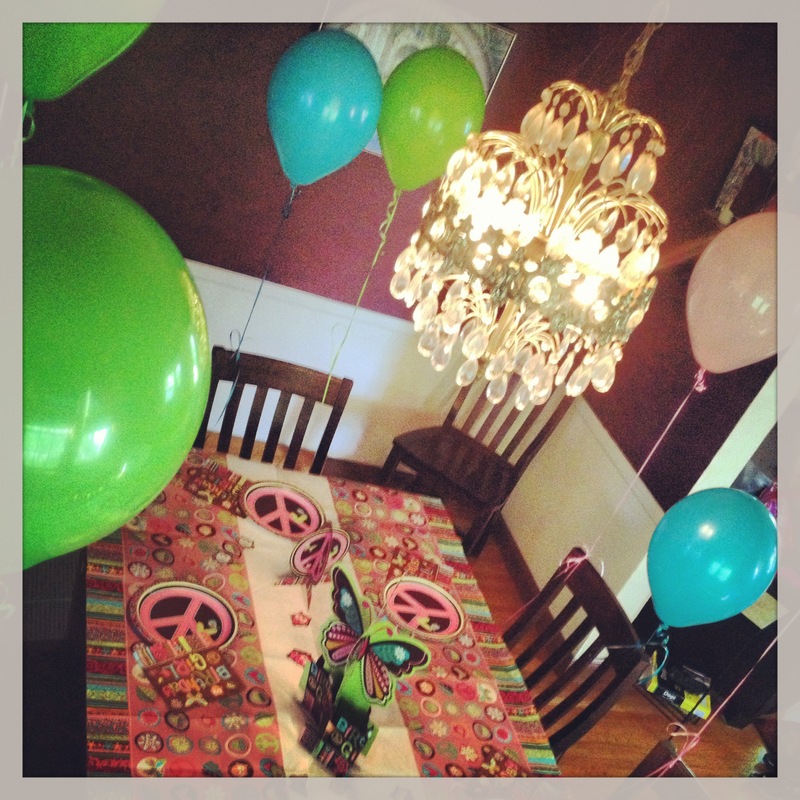 the day of the party for decor and balloons. I’m not stressed in the least. Odd. Then home by 12:45 to pull off a major house overhaul, decorate and head to school by 2:00 to pick up Ava and two of her guests. She is really surprised by the transformation at home and seems delighted by it. I think she thought there was no way I could pull it off given the state of the house when she left for school. We hang out til we can drop off her younger brother at class. Then we are on our way to Aunt Katie’s for make-up and hair at Ava’s request. We arrive at 4:15 and our fourth guest, Sophie, meets us there. 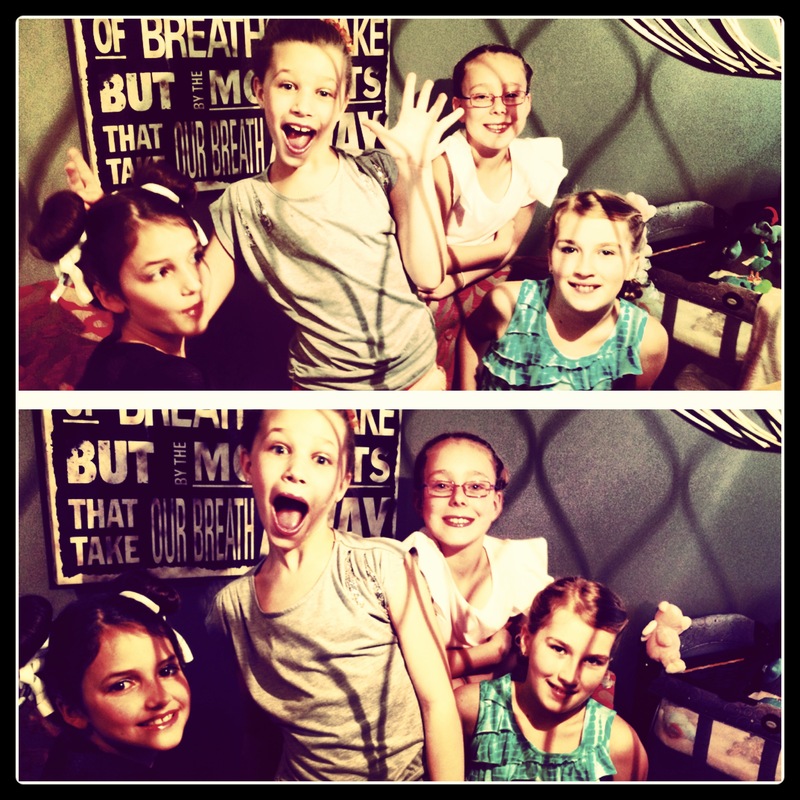 The four girls all get a different look hair and make-up wise – – the common thread: sock-buns and glitter eyeshadow. We’re out the door by 5:30 for the St. Louis Park Roller Garden. We arrive, pay admission and rental ($8 per girl) and take the floor. I swear at least 15 birthday parties are happening – – it is kids night from 4-8 after all. We all skate, including me, and snack on pretzels and soda. One boy who is kind of a terror on the rink, gets a stern talking to from Sophie. We unlace around 8:00 and head to Fireside Pizza. I like this neighborhood joint (we went there for my son’s 6th birthday), but I forget that service is slow. About 50 minutes after we order, our pizzas and pastas arrive. I do hear some really good stories in the meantime — everyone has a story about the ocean, there’s some crude/rude humor, but no boy talk. Maybe that’s for later? I thoroughly enjoy the conversation. We’re home by 9:45, but too full for cake just yet. So it’s on to presents then pedicures. Thank god there are only four — they each get a footbath, massage and polish. They all choose differently — fuchsia, candy apple red, purple and smurfy blue. They’re kicking back and watching the movie Hook during pedi time. 11:45p.m. rolls around and we’re ready for cake. Super late I know, but not letting this wait til the a.m. Calvin is still up to witness this. 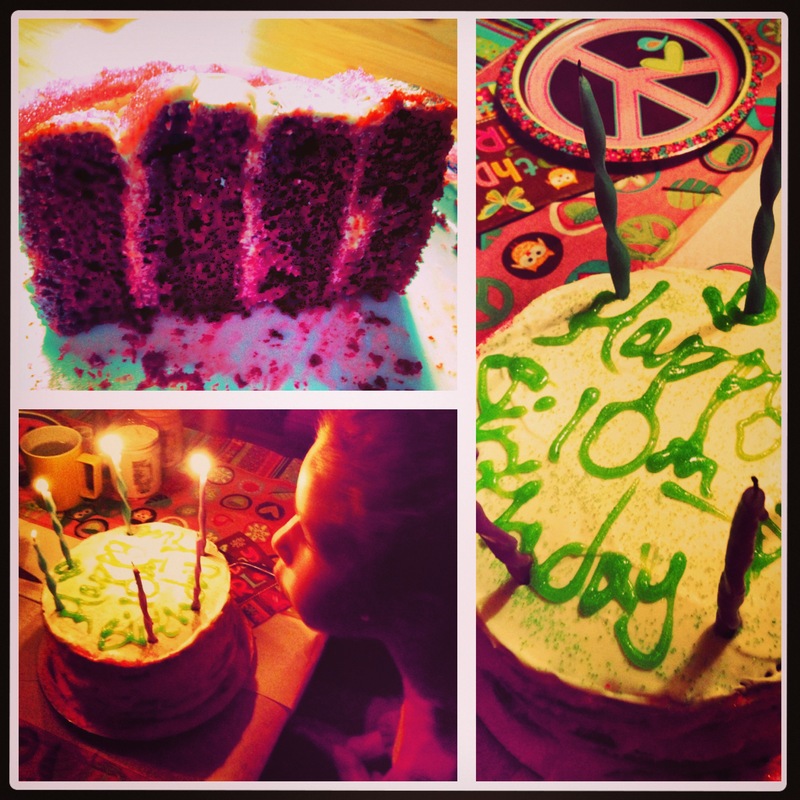 And so the song goes, the candles are blown out, the cake is cut, and the vanilla and strawberry ice cream scooped. NOW, can it be time for bed? Yes, it’s close for sure. Back to their sleeping quarters and time for some girl talk. I turn out the lights and fall exhausted into bed. The next morning comes quickly and I’m up with coffee. Enjoying 15 minutes before it’s time for a waffle breakfast. The girls seem a bit tired (12:45a.m. = reported bedtime), but in good spirits nonetheless. No sooner than they finish up their breakfast and pack up their stuff do their parents arrive for pick-up. We take some photos and call it a party. We wave goodbye to our guests and take a moment to recap. Then it’s off to more adventures for the day, knowing we have the weekend to recover.